Monday 13 July 1896 was the fourth day that year in which a maximum temperature of 86 degrees was registered in London. Though the weather looked unsettled, Thomas Hawkins (or Hawkin or Hankin, depending on which report you read), of Cornwallis Road, Upper Holloway, set out for Parliament Hill Fields with his friend William Wright and Wright’s dog. On the way they stopped in the Duke of St Albans pub in Highgate Road, where they met William French, a 50-year-old stableman who lived in the same lodging-house as Wright, in Flowers Mews, off the Archway Road. French also had a dog with him. The three of them, with two other men – all of them quite sober, apparently – eventually moved on to Parliament Hill Fields, where, at about four o’clock, they started throwing sticks into one of the Highgate ponds, for the dogs to retrieve. After French’s dog had been in the water for some time, it seemed to be too tired to get back to the shore. ‘I can’t see the poor little fellow drown,’ said French, and he took off his coat, waistcoat and hat and jumped into the water, still wearing his trousers and heavy boots. He swam out to the dog, but on the way back he suddenly called out ‘I’m knocked’ and sank. A park constable was sent for, but by the time he arrived with equipment to drag the water French’s companions had left and, not knowing exactly where French had gone under, it took about an hour, with the aid of a boat, to recover the body, some seven yards from the bank. Having read the report of the inquest on William French, who was drowned at Highgate Ponds while rescuing a little dog, I sent to the authorities to ascertain certain particulars, and found that the brave fellow had been buried in a pauper’s grave. Fortunately the funeral was only just over, and I was able to get the body transferred to a first-class grave, over which a few friends, who love dogs, and are anxious French’s gallant act of humanity shall not pass unrecognised, propose to erect a suitable memorial. 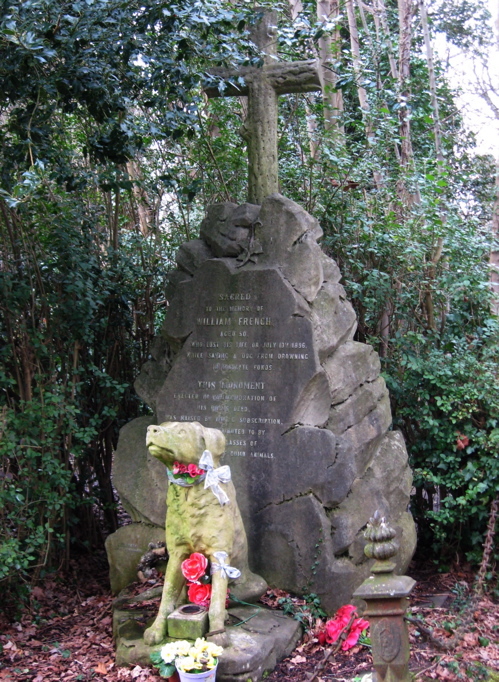 The stone dog that forms part of the eventual memorial, in St Pancras Cemetery, is frequently decorated with flowers and ribbons, but the main part of the monument, recording French’s act, receives no such tributes. In fact his dog had ducked under the water when French reached it, then reappearing on the surface and swimming safely to the shore. Most visitors to the cemetery find this memorial, sooner or later, and like it, so there are always flowers there. And near it is an informal ‘feeding station’ where a lady regularly feeds foxes and cats; they wait patiently for her every afternoon. I’ve seen the food left, and I think I’ve also seen the woman who leaves it, but not the waiting foxes and cats. Must be an odd sight.